Today there's so much exciting news to share with you, I'm all giddy about it. Firstly, it's my birthday! I normally don't really care for birthdays, particularly my own, but I'm turning 25 and that's sort of a big deal, right?! A quarter of a century... Let's not think too much about it!! 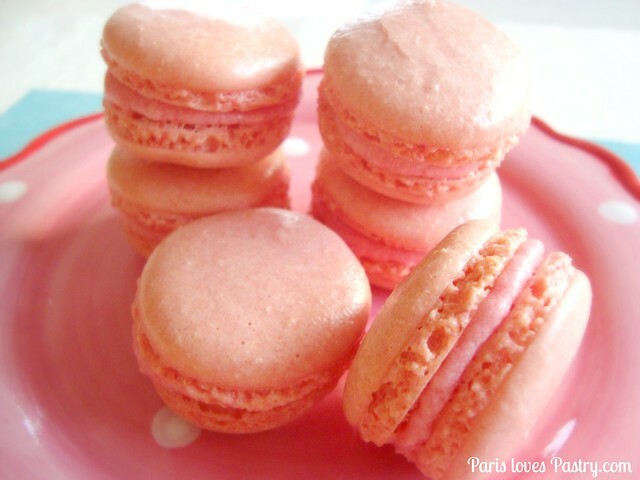 Secondly, I've made heavenly strawberry macarons to celebrate this day. They're pink, lovely and delicious! I used a macaron mat making them, which made everything so much easier. 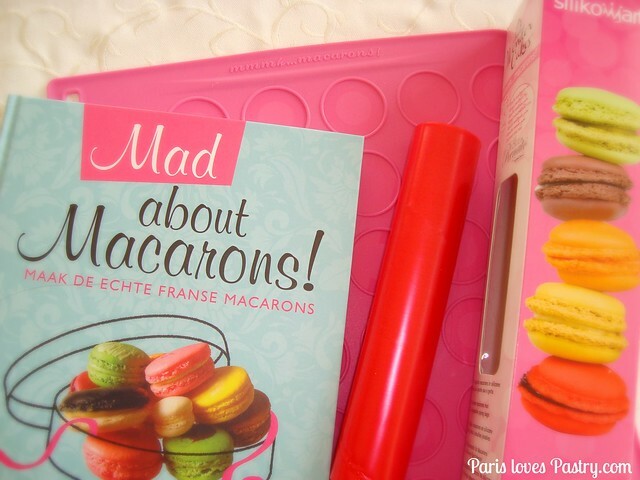 And lastly, Silikomart and I wanted to give one reader the macaron kit as well. Joyful news! The Silikomart macaron kit comes with a bright pink macaron mat, disposable piping bags and a manual/recipe guide. Because the circles are already formed on the mat, it made all of my macarons of the same, circular size. Normally, I draw circles on a piece of parchment which is incredibly tedious and time consuming to do. Plus, using disposable bags to pipe the batter means less cleaning up - always great! I really recommend the macaron kit for someone who is still learning or a beginner at making macarons, as it omits a few tricky parts of the process. And macarons are challenging enough to bake; everything that makes it easier, is a winner in my book! 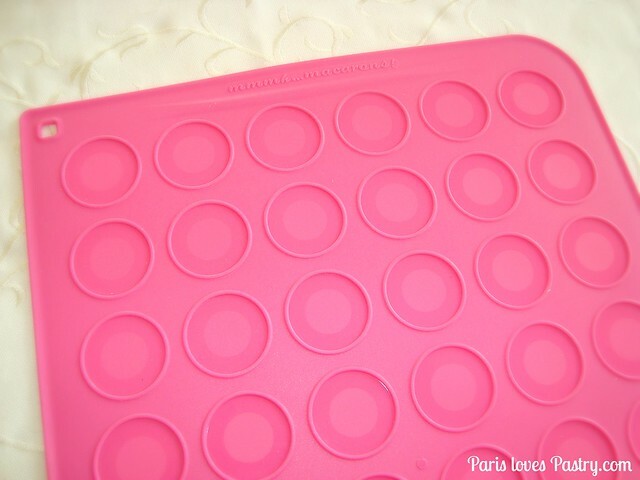 I'll definitely keep using the macaron mat in the future when making macarons. The cookbook 'Mad about Macarons' by Jill Colonna from Good Cook Publishing, was given to me by Silikomart. 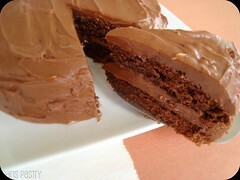 And the recipe I've made is inspired from the book! Strawberry Macarons: I used the base recipe in the book from 'Mad about Macarons' and added strawberry jam and pink food coloring. - Line three flat baking sheets with grease-proof paper and set aside. 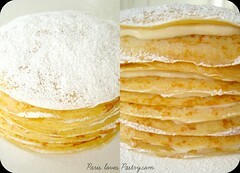 - Whisk the egg whites (at room temperature) to glossy firm peaks adding the caster sugar gradually. If making coloured macarons, then add a dash of colouring towards the end of mixing. - Sift together your ground almonds with the icing sugar using a medium sieve and mix well. - Work on the mixture using a plastic scraper. Press down well with the scraper, going back and forward, to press out the oxygen from the whites. Do this for no more than 5 minutes until you have a smooth mixture. The result should fall like a “ribbon” off the scraper. 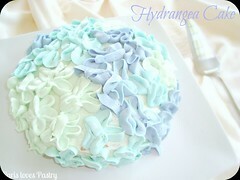 - Transfer the mixture to a piping bag with a plain 1cm round tip. - Pipe out 3cm rounds, leaving a good space between each as they do spread out. - Leave for about 30 minutes to set. - While they are setting preheat the oven to 160°C fan setting. If you do not have a fan oven you may need to make the temperature slightly higher. 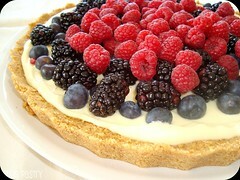 - Bake in the centre of the oven for about 10-12 minutes. 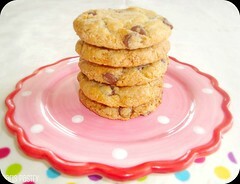 - When ready, leave on the baking tray until cool then scrape them all off carefully with a palette knife. In a bowl with an electric mixer, pulse the strawberry jam. Add in butter and vanilla, and 1 cup of the sugar. Pulse until well combined. Add in small amounts the rest of the powdered sugar, pulsing after each addition, to reach the desired consistency. Add in food coloring. 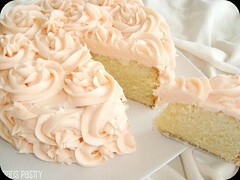 Frosting should be smooth and soft, yet hold its shape. Silikomart is offering one reader this great macaron kit! 1. Leave a comment telling me which macaron-flavor you would love to bake. A classic flavor? Or an exotic combination? I would love to hear your ideas. in your comment, even if you're already following us. 3. 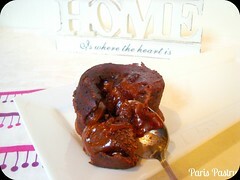 For another extra entry, become a public follower of Paris Loves Pastry on Blogger. 4. Extra entry: Follow me on Twitter! Don't forget to leave me your e-mail adress in the comment! Giveaway closes on December 1st. It is open to all countries. I would LOVE to win this! 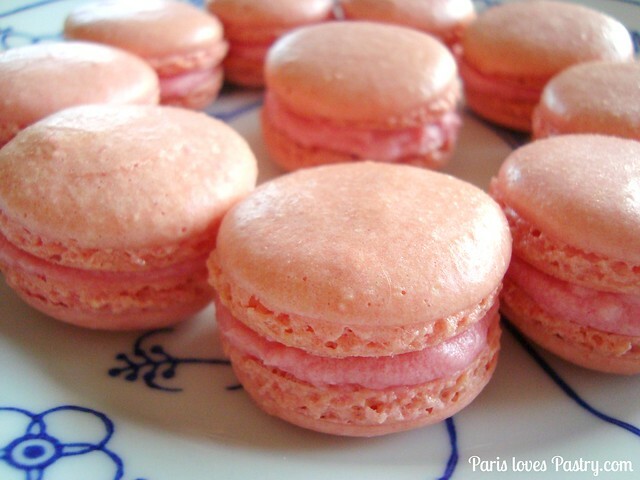 I was actually thinking the other day that I wanted to try to make strawberry macaroons (my fave!)! Love macarons! Chocolate ones are my favourites! And i would love to win this giveaway! I'm allready following you on fb and blogger. 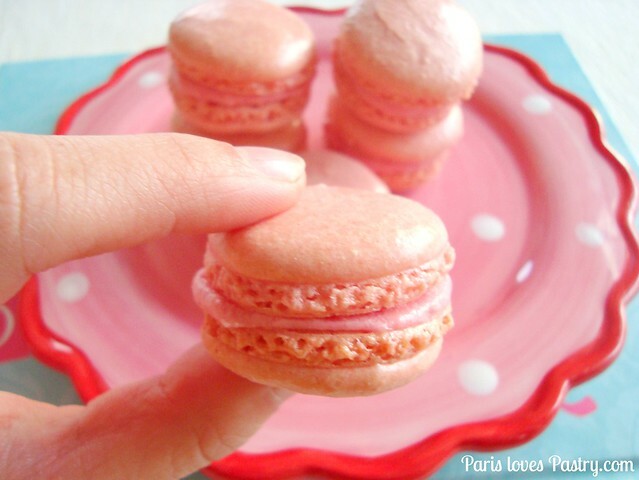 I've never made macaroons, but I have tasted them and they are like little cookie heavens :) The best macaroon flavor I had when I went to paris was this strawberry kind. If these taste anything like those, then I can't wait to make them! But I'd also like to make something like gingerbread, but I'm not sure if that would be too heavy as a macaroon. 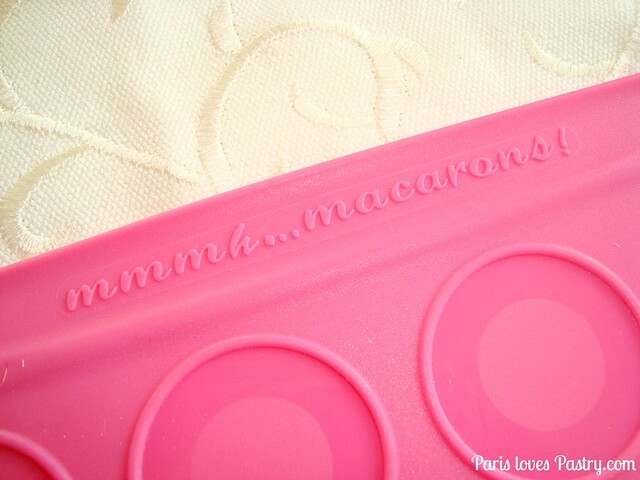 I can't believe I've never seen the macaron mat before! That would be an incredible help! 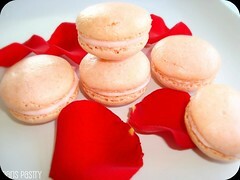 I die for rose macarons...so should I win the prize...that's what I'll be making! question 1: i think i would love to try all kinds of flavour since i never try to make one ..i really wanna try to bake one!! question 4 n 5: sadly i never ever have twitter because im afraid i cant focus on my study hehe..n i dont have instagram cause i only use simple handphone..
n my email : nabila456789@yahoo.com..
stay happy..n happy birthday !!=).. Would love to win this set! I really want to make a salted caramel macaron, i tasted this once and it's delicious. now i want to make this myself. I already followed you on instgram, blogger and facebook en just followed you on twitter! and congrats ofcourse! quart of a century, something to celebrate! I would Love to win this kit, it's so pretty! 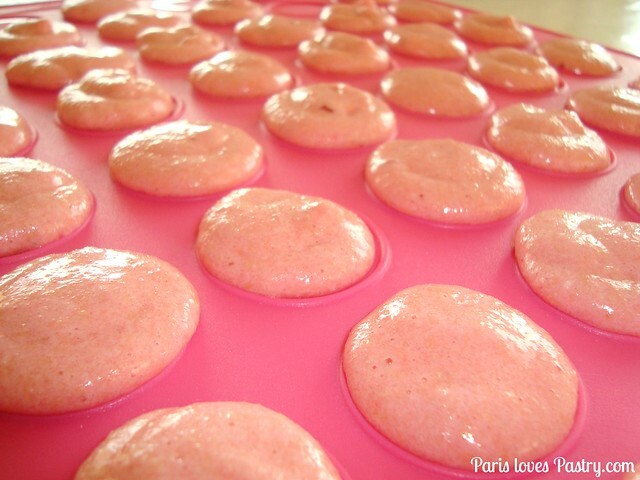 I'm a big fan of pink, so I would definitely like to try the Strawberry Macaroons as my first attempt. I already "like" you on Facebook! Have a Happy Birhtday! I would probably try some classic flavors first - for example vanilla with white chocolate cream. Then I'd try something more extravagant - maybe pineapple with dark chocolate (choc macaron with pineapple cream). I follow you on Facebook and on Blogger. I'm not using Twitter that much and don't have Instagram. I follow on Facebook and twitter (s_underfoot). Pistachio. Definitely pistachio...maybe with a chocolate filling. i follow you via gfc as Ava Grace's Closet. annnnd I liked your fb page! Great giveaway! How fun! I have been dying to try making them!! The strawberry looks amazing but I once had a mocha flavor that was crazy good too. Oh my goodness! Winning this would make me the happiest girl in the world hehe. This is such an amazing giveaway! I love green tea macs made with macha powder. These look amazing and that's my favourite shade of pink. I'm a macaron addict! During my recent holiday to Oman I had sandalwood flavour and raspberry and rosemary which I would love to recreate - deliciously different! Happy Birthday!! My Birthday was the day before!! ;) but I turned 28 :S Hope you had a fantastic day!! Happy birthday! =) Greetings from Singapore! this giveaway looks so awesome, i really hope i can get it! Have liked you on facebook! and am following you on Blogger as well. Pity i don't have a twitter or instagram account though. I like chocolate macarons best, but I'm open to trying other flavors. I follow you on blogger to :) I don't have a twitter, otherwise I would follow you on that too. Haven't made macarons for ages.. I would like to make some right now. 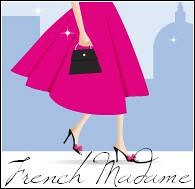 I'm already following you in FB and Blogger! I would like to try pinapple/mango as a flavor combination. Happy birthday! Yes, 25 is a big deal. I've always wanted to try a lemon or blueberry macaron would be really good! 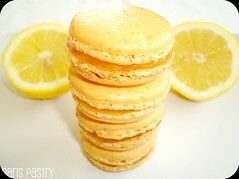 I would love to make a batch of Lemon Verbina Macarons! I would love that kit! 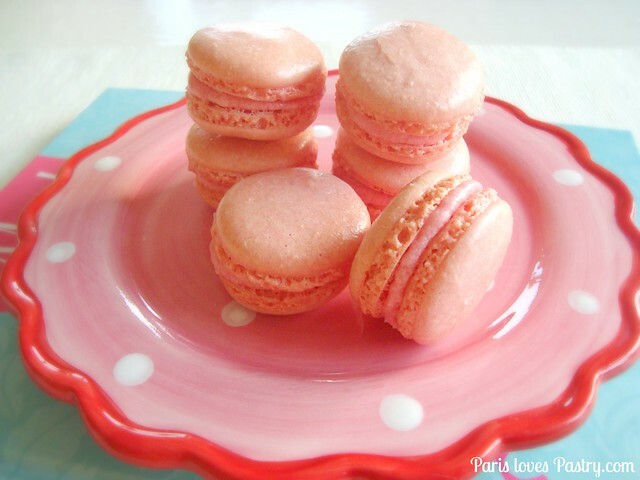 Since I've only made chocolate macarons, I would like to try your strawberry ones - I absolutely love strawberry!! Lemon or pistacio macaroons. Nom!!! I've only ever made made macarons once in my life and they were a total baking failure. They tasted lovely though, like crispy, pillow-y marshmallows. They were the only macs I ever ate in my life too. If I could bake up a batch, I think a simple vanilla-flavoured macaron would be nice- with chocolate filling. I've been a follower of your blog for a while now. You bake really lovely things. My email is sumaiyyahabidah [at] gmail [dot] com. I'd love to bake earl-grey + cookies & cream macarons! Two of my most favorite flavors. I HAVE BEEN A HUGE FAN OF YOUR BLOG SINCE A YEAR AGO AND HAVE BEEN FOLLOWING YOU ON FACEBOOK EVER SINCE TOO! My favorite are pistachio macaroons. 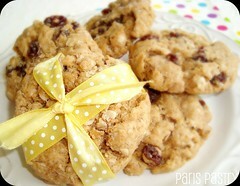 I like Paris Loves Pastry on Facebook. I have followed on twitter. BTW, cheesecake-filled macarons are my favorites. 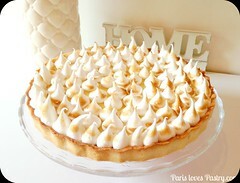 Hope I can make some soon! Oh how super cool!!! 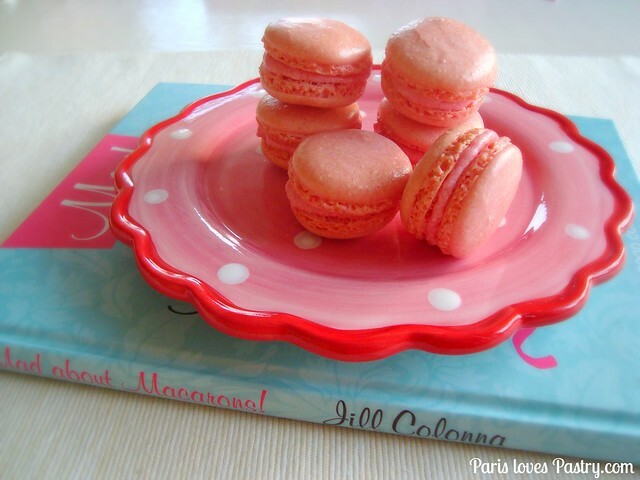 I love love love macarons ....I would have to try your strawberry recipe for sure...and maybe some mint chocolate ones too!!! !